Why can’t economists understand margin compression? Are basic accounting statements so difficult to interpret? According to Viennacapitalist, who commented on my previous post, it does seem so. At least for macroeconomists. Indeed, Werner seemed to imply that most economists did not know that deposits sat on the liability side of a bank’s balance sheet (he’s surely wrong), and I have many times pointed out the central bankers’ and policymakers’ misunderstanding of banking mechanics. Three researchers from the BIS just confirmed the trend. In a new working paper called ‘Has the transmission of policy rates to lending rates been impaired by the Global Financial Crisis?’, they wonder, and try to find out, why spreads between central banks’ base rates and lending rates have jumped once base rates reached the zero-lower bound. It’s a debate I’ve already had almost a year ago, when I tried to explain that, due to the margin compression effect (an accounting phenomenon), spreads would have to increase in order allow banks to generate sufficient earnings to report (at least) positive accounting net incomes (see here and here). This looks very very similar to my own charts. Clearly, spreads jumped across the board: pre-crisis, they were around 1.5% in the US, 1.5% in the UK and 1.25/1.5% in Spain and Italy. 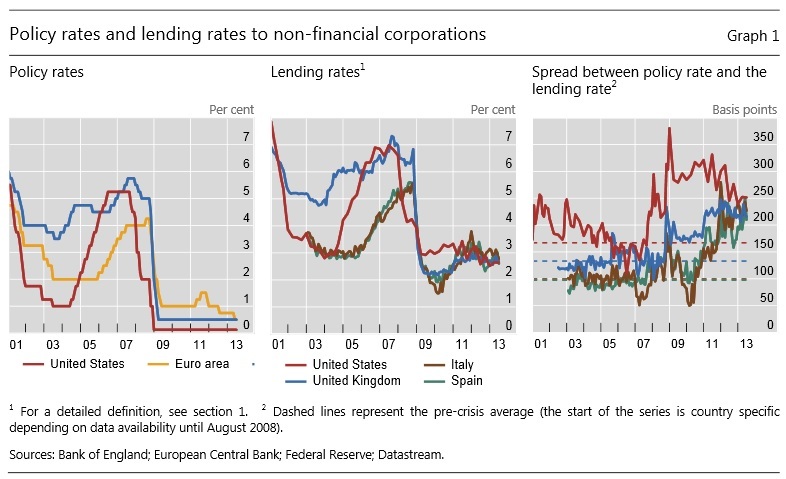 In 2009/2010, with base rate dropping to the zero-lower bound, things changed completely: spreads were of 3% in the US, 2.25% in the UK, 2% in Spain and 1.5% in Italy. Rates had not dropped as much as base rates. Worse, spreads on average increased afterwards: by 2013, spreads were around 2.5% in all countries. The BIS researchers tried to understand why. Unfortunately, they focused on the wrong factors. They built a model that concluded that the “less pass-through seems to be related in part to higher premium for risk required by banks and by worsening of their financial conditions as well.” They are probably right that some of these factors did play a role. But they cannot explain why the spread remains so elevated even in economies that have experienced strong recoveries such as the US or, more recently the UK. But their study also has a number of other problems. First, they used new lending data only. It is extremely tricky to extract credit risk information from new lending rate figures. Why? Because new lending rates only show credit actually extended. Many borrowers cannot access credit altogether or simply refuse to do so at high rates. Consequently, the figures could well only reflect borrowers that have relatively good credit risk in the first place as banks try to eliminate credit risk from their portfolio. Second, they never ever discuss operating costs and margin compression, as if banks could simply lower interest income to close to 0 and get away with it. But for this, they should have looked at two things: deposit rates and banks’ back books (i.e. legacy lending). Not new lending only. When the margin between deposit rates and lending rates on back books fall below banks’ operating costs, banks have to offset that decline by increasing spreads. This is why I suggested that the actual lowering base rates ceased to be effective from around 1.5 to 2% downward as a means of reducing household and companies’ borrowing rates. Problem is, very few researchers and policymakers seem to get it. Patrick Honohan, of the Irish Central Bank, and Benoit Coeuré, of the ECB, do seem to understand what the issue is. Bankers and consultants have for a while (see Deloitte at the end of this post). Some economic commentators assert that it is hard to figure out why bankers keep complaining about low rates. This dichotomy between theorists and practitioners is leading to misguided, and potentially harmful, policies. But let me ask a simple question. How hard is it to understand bank accounting really? The views and opinions expressed on this blog are my own and do not reflect those of any of my previous and current employers. This blog also does not provide any investment advice and only provides a big picture-type analysis of the fundamental mechanics of the financial system and its link to the overall economy.